Opis: The Present Status of the Leprosy Problem in Hawaii; The Reaction of Lepers to Moro's "Percutaneous" Test; A Note Upon the Possibility of the Mosquito Acting in the Transmission of Lepsory (Classic Reprint) - Brinckerhoff Walter R.
Leprosy has had an important influence on public health and social conditions in the Hawaiian Islands for many years, and notwithstanding the fact that isolation of the disease has been practiced for more than four decades, it continues to be a serious problem and a tax upon the resources of those islands. The disease has also been shown to be widely disseminated throughout the United States. A commission of medical officers of the United States Public Health and Marine-Hospital Service, appointed in accordance with the act of Congress approved March 2, 1899, investigated the prevalence of the disease and rendered a report, which shows that there were at least 278 well-authenticated cases at that time existing in 21 separate States and Territories. The cause of the disease is now known and recognized as being a specific organism - the Bacillus lepr discovered by Hansen - but little is known of the method of its transmission or of the channels through which it effects an entrance into the human economy. With the acquisition of Hawaii by the United States, leprosy became more than ever a national problem, and it was recognized that the disease should receive serious study with the view to eliciting further information as to the methods of its dissemination and with the hope that a cure would eventually be evolved. Representations were therefore made to Congress urging the establishment of a leper investigation station on the island of Molokai, in order that advantage might be taken of the excellent opportunities afforded by the leper settlement tor scientific study of the disease. As a result, Congress passed an act, which was approved March 3, 1905, providing for the investigation of leprosy in Hawaii. In accordance with the provisions of this act, a suitable tract of land was ceded by the Territory of Hawaii to the United States, and steps were taken to establish thereon a hospital station and laboratory of the Public Health and Marine-Hospital Service. The construction of the necessary buildings is nearing completion, and in the meantime Dr. Walter P. Brinckerhoff, who was appointed director of the station, has been engaged in scientific studies of the disease. While investigations of this character present problems of unusual difficulty, they are sure to advance our knowledge of the disease and to result in improved treatment and possible cure. 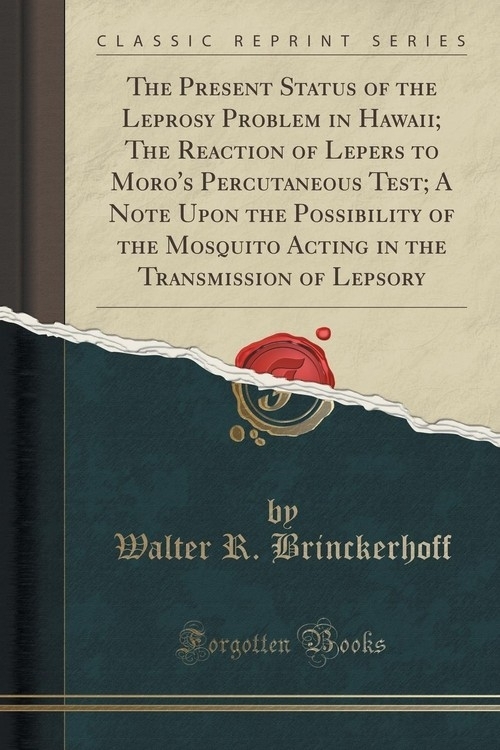 Szczegóły: The Present Status of the Leprosy Problem in Hawaii; The Reaction of Lepers to Moro's "Percutaneous" Test; A Note Upon the Possibility of the Mosquito Acting in the Transmission of Lepsory (Classic Reprint) - Brinckerhoff Walter R.
Recenzje: The Present Status of the Leprosy Problem in Hawaii; The Reaction of Lepers to Moro's "Percutaneous" Test; A Note Upon the Possibility of the Mosquito Acting in the Transmission of Lepsory (Classic Reprint) - Brinckerhoff Walter R.